SAMARITAN’S PURSE TRANSITIONS FROM A MASSIVE HURRICANE RELIEF EFFORT TO MAJOR RECONSTRUCTION PROJECTS. Much of last Autumn’s news focused on pain and devastation in the Caribbean after the double whammy of hurricanes Irma and Maria. Now those daily reports have long since faded as crews have moved on to cover other events. Samaritan’s Purse nonetheless continues serving the islands of Puerto Rico, Barbuda, Dominica, and St. Martin. We mounted an urgent and ongoing response after both monstrous storms, and today we’re transitioning from recovery to rebuilding on each island. One of the strongest Atlantic storms ever observed, Irma battered the region first in the beginning of September. Two weeks later Maria unleashed her fury. They were the first pair of Atlantic Category 5 hurricanes to occur during the same year since 2007. Samaritan’s Purse rapidly mobilised and dispatched hundreds of volunteers to the tattered islands. We airlifted needed supplies on our DC-8 and DC-3 aircraft, including tarpaulin, hygiene kits, blankets, jerry cans, water filters, solar lamps, and generators. We also distributed food and set up water treatment centres. On Puerto Rico, we deployed our helicopter to deliver relief to remote communities. 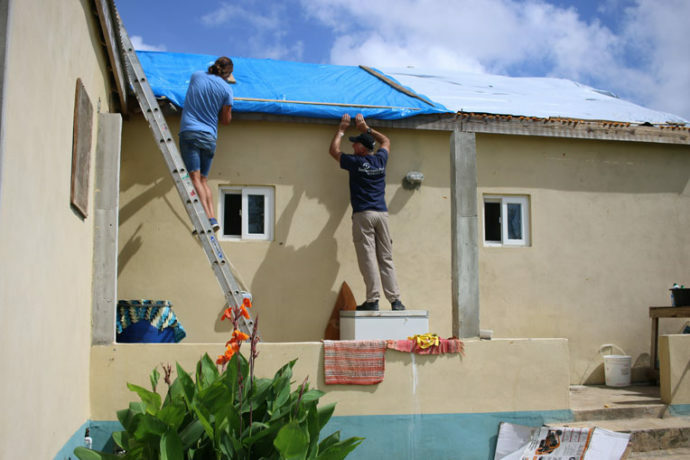 As these initial disaster relief efforts wound down late last year, we started moving forward with plans to help rebuild homes and churches on all four islands. The work has already started on Barbuda, Dominica, and St. Martin; and rebuilding efforts on Puerto Rico will be launched very soon. In certain circumstances, we will be recruiting volunteers who can travel to and work on the respective islands. Otherwise we will rely on our own international field staff or hire local help-a move that will aid the local economy. Wherever we’re deployed, our staff and volunteers will partner with local churches to identify at-risk families in great need of assistance. Together, we’ll serve and meet tangible needs in the Name of Jesus Christ. Puerto Rico: Hurricane Maria’s fierce winds and pounding rain decimated the U.S. commonwealth. Our goal is to help rebuild 500 homes and 20 churches over the next one to two years. A volunteer network will soon be up and running. According to reports, 84 percent of the embattled island has power back, but more than 400,000 customers are still without electricity-many of whom live in hard-to-access mountain regions. As a result, we will be distributing small solar units that can be mounted on roofs. These units can supply enough electricity to provide for a small house (including a refrigerator). Barbuda: Hurricane Irma flattened the island, home to about 1,700 people. Most are still living on the nearby sister island of Antigua, but more and more are trickling back to Barbuda. We already have several staff members stationed there, and they’re hard at work. To date, they’ve already repaired 18 homes and are aiming to tackle another 55 more by the end of July. They will also work on three churches that were significantly damaged. We are recruiting volunteers who can help with this rebuilding project. In addition, we continue to maintain our reverse-osmosis plant that’s producing safe water for families. Dominica: Hurricane Maria’s Category 5 winds pulverized the island. Right now, we have 10 international field staff and a team of 15 national staff on the ground, and that’s growing. Up first will be assisting with an estimated 1,000 roof repairs. Over the next two to three years, we’re also planning to help reconstruct about 30 churches across the island, as well as providing reconstruction support to approximately 825 beneficiaries through our home repair efforts. In partnership with UNICEF and the local water company, we’re continuing to produce clean, safe drinking water and trucking it to needy communities. At the same time, we’re exploring how we can help people-including poultry farmers and fishermen-rebuild their livelihoods. St. Martin: The island sustained extensive damage when Hurricane Irma barreled through. Samaritan’s Purse was the first relief organization to arrive to pass out food, water, and heavy-duty shelter tarp. There’s a five-person team already at work, and our goal is to repair 15-20 churches, restore 100 houses, and provide 500 families with assistance (large appliance distribution) over the next nine months. 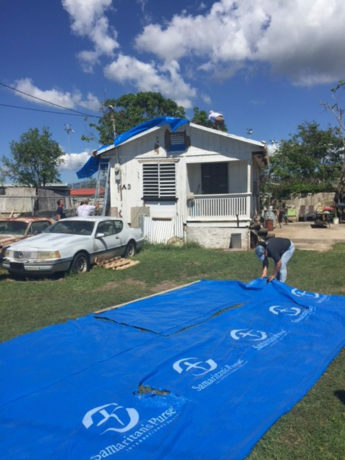 We provided heavy-duty shelter plastic to many families.